Tennessee Highway Patrol troopers say a single car crash in Campbell County killed a LaFollette man Tuesday who was riding in the car with his mom. Troopers say it happened on Bethlehem Road shortly before 3:00 p.m. They say Annette Meadows was heading northbound. They say she drove off the right side of the road, hit a culvert, and flipped her car. The car stopped on its top. The crash killed her son 35-year-old Travis Meadows. He was a passenger in the car. ONEIDA, Tenn. (AP) - Officials with Big South Fork National River and Recreation Area and the Obed Wild and Scenic River say hog hunting season has opened. Two parishioners withdraw their lawsuit against a LaFollette church on Tuesday. (WBIR - Campbell County) Investigators in Campbell County were immersed in two major searches on Monday. While the sheriff's office continued its search for a woman who has been missing for almost a week, state investigators are on the hunt for a man on TBI's Top 10 Most Wanted list. (WBIR-Coalfield) Coalfield went to its first football state championship game on Friday. Despite losing to Union City, 56-14, the community of Coalfield said this is a huge moment for their town. The Scott County hospital marked a major milestone this week. The hospital reopened one year ago after being closed for 19 months. That closure was a scary time for the community. Campbell County deputies are trying to find a LaFollette woman who has been missing since Tuesday morning. 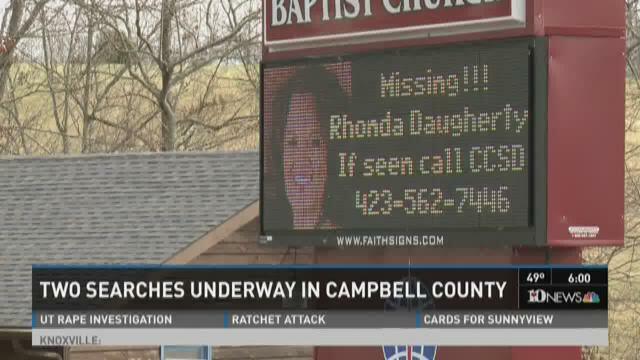 Rhonda Daugherty, 49, was last seen in the Coolidge area of Campbell County, according to a sheriff's office release. Daugherty has auburn hair and hazel eyes. She weighs about 150 pounds and is 5'3" tall. If you have any information as to where Daugherty could be, you're asked to call 911 or the Campbell County Sheriff's Office at 423-562-7446.